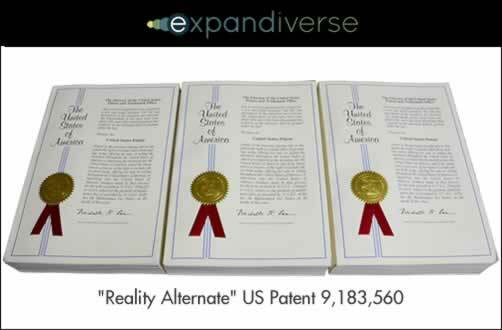 The first patent for transformative Expandiverse™ Technology was issued by the U.S. Patent Office, in a patent named “Reality Alternate.” Over 375 subsequent patents have already cited this new patent*, including 75 patents from 8 of the 10 biggest tech companies in the world: Apple, Google, Samsung, Microsoft, IBM, Intel, Oracle and Hon Hai (Foxconn). This patent’s 1,400 page specification was divided into 31 areas of technology by the US Patent Office. The Expandiverse plans to grow a patent family named “Patents From the Future™” between now and 2031, when this IP expires. “Active Knowledge” platforms and applications deliver just-in-time best practices as step-by-step guidance, with online access to resources, to expand abilities and productivity during tasks. “Shared Planetary Life Spaces,” add always on, continuous relationships between people, companies, services and online resources; with privacy and active/inactive states; to expand life in multiple new ways. “Digital Boundaries” add digital physical and online protections, to expand personal security both online and in the physical world. “Blended screens” on “families of devices” expand each person’s control over their online worlds as they switch between multiple devices. Expandiverse Technology provides always on, real-time business processes between companies’ employees, partners, business systems and customers. Some of areas that will be transformed include shopping, supply chain, health, learning, communications, daily living and entertainment. For example, the war between ad blocking and spamvertising can be replaced with personal ad paywalls that use blended screens to deliver the ads each consumer wants, making marketing budgets actually work. Then consumers can choose always on company relationships that delight them. Customer-centered companies will deliver continuously connected personal journeys. IDC forecasts indicate Expandiverse Technology is timed well because by 2016, 65% of large enterprises will shift their focus to become information-based; and by 2017 two-thirds of CEO’s of the G2000 will change their corporate strategy to Digital Transformation. Experts forecast the resulting digital transformation will cause up to 40% of companies and 47% of jobs to become obsolete. For leading companies and technology vendors, this patent launches the 21st century into an EXPANDing unIVERSE of transformative goals, strategies and business opportunities. They can access this new Digital Earth 2025 Architecture at DigitalEarth2025.com, and Expandiverse Technology and services at Expandiverse.com. To schedule a briefing or interview with the inventor/founder, please contact Dan Abelow at 407-786-7422 or dan@expandiverse.com. *Number of patent citations updated to 375 as of January 28, 2015. At the December 15, 2015 press release date, there were over 335 patent citations. Share the post "New Expandiverse Technology poised to transform business processes, marketing and customer relationships"